Last month, we launched CAREEREALISM’s free Recruiter Directory - a tool that helps recruiters become more visible so you can attract talent. We have over 1,000,000+ job seekers visiting our site each month – and we want to introduce them to you and your company. As of now, over 200 recruiters have set up their recruiter branding profile on CAREEREALISM and over 30,000 passive job seekers have specifically checked out the credentials of the recruiters showcased on our site. And, we’ve seen some incredible professional power unlocked. Studies show job seekers have the same behaviors as consumers. [This Inc Magazine article explains in detail why.] Candidates research recruiters online before talking to them. A quick Internet search of your name and the word “recruiter” is all it takes for a candidate to assess your top-fold – a.k.a the first five things that come up about you on the Internet. Besides your LinkedIn profile, what do you have that speaks to your expertise as a recruiter? If your top-fold fails to have anything interesting, your credibility goes down. These 200 recruiters all have profiles that come up in their top-folds and encourage talent to click on them. 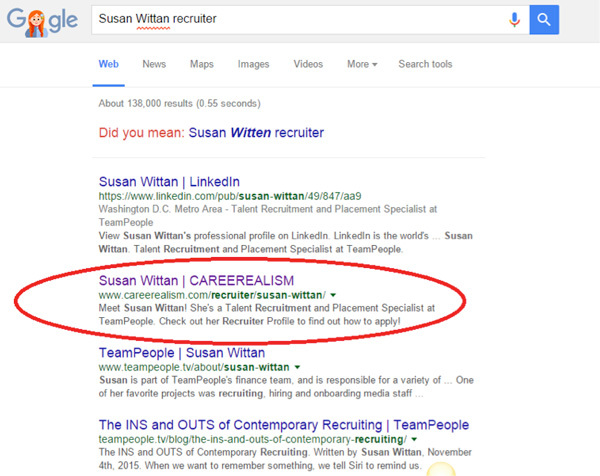 Below is the search result for top recruiter, Susan Wittan. By having both her LinkedIn profile and her CAREEREALISM profile, she gains instant credibility as a proven recruiter. Being listed as a “featured” recruiter immediately gives job seekers the impression a recruiter is special – which is true! These recruiters have taken the time to complete a professional profile showcasing all their relevant social media profiles, company pages, and some vital information to help candidates connect with them more effectively. This makes them stand out against their competitors. 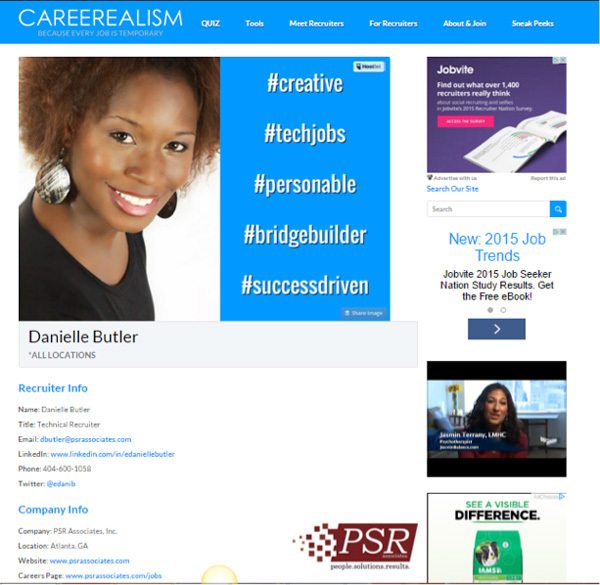 Below is a picture of top recruiter, Danielle Butler’s profile designed to showcase her success. Their recruiter profiles encourage candidates to easily visit their companies’ most important recruiting pages. Since these job seekers weren’t actively looking at the employer until they reviewed the recruiter’s profile, this is a new way to attract passive candidates and get them to review the company’s open positions. Below is a close up picture of top recruiter, Danielle Butler’s profile. By putting all relevant links to the company’s social media and careers pages in one place, the candidate is saved the trouble of having to search for the information on their own. This makes it more likely they will look at all the company’s information and click on it. Many of these recruiters have participated in our “top recruiter contest,” giving them additionally visibility that’s driving job seekers to check them out. They’re also creating ‘Sneak Peeks’ showcasing desirable aspects of working for the employer and using those to drive more views to their company’s open positions. Instead of having to knock on the doors of candidates and beg them to talk, these recruiters are using easy-to-create content that makes the talent come to them. 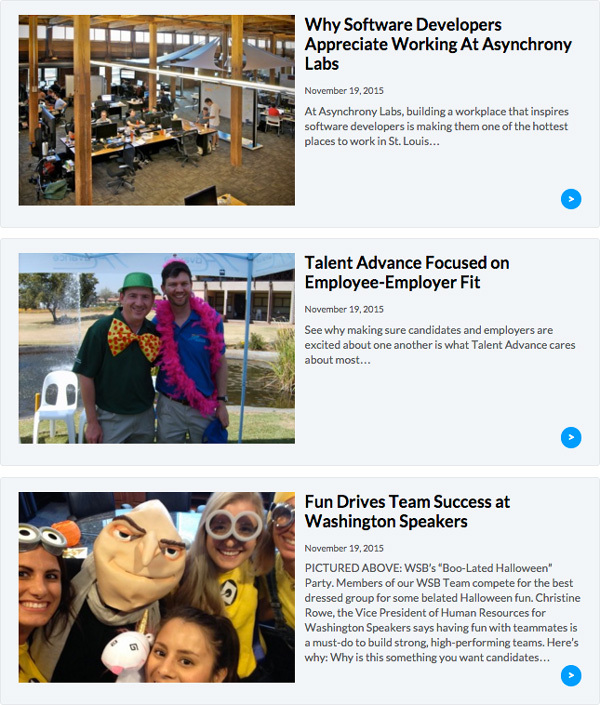 Below is a picture of some of the more popular ‘Sneak Peeks’ created by top recruiters on CAREEREALISM that feature interesting aspects of working for their employers. Each article can be shared on all their social media platforms, driving even more candidates to their open positions. Job seekers have greater respect for any recruiter who is clearly trying to provide them with all the information they need to become interested in working for the company. Tech-savvy recruiters who create online profiles and content designed to assist the job seeker prove they know how the job search is being done today. These recruiters are catering to the needs of the sophisticated job seeker, and scoring points with top talent in the process. In 2016, finding candidates and filling open positions will come down to the reputation and talents of individual recruiters. All the technology in the world will not replace the fact that the best candidates will only speak to the best recruiters. If you aren’t proving to the world you are an accomplished recruiting professional, you won’t be able to attract the candidates your company needs. 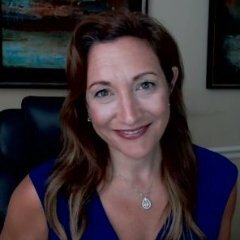 Like it or not, your reputation will play a major factor in the quality of the talent that is willing to consider your open positions. The more you information and resources you provide, the better the chances they’ll take your phone call and respond to your email. PS – I invite you to come learn more about CAREEREALISM’s free Recruiter Directory and how you can get featured to 1,000,000+ monthly job seekers. Plus, we hold weekly "Top Recruiter" contests that can help you get even more exposure for your open positions. Learn more.